Right off the bat, it’s easy to tell that Yelp is not designed for professionals such as attorneys. While the word “specialty” gets thrown around a lot, for a professional such as an attorney, doctor, or accountant, specialty can mean something very particular. In Kentucky, for example, attorneys are not allowed to claim a “specialty” at all except under very specific circumstances. Thus, even creating a listing on Yelp could theoretically land a Kentucky attorney in hot water! Lawrence & Associates has attempted to compromise by listing our areas of practice in this section, but by also explicitly stating that none is a “specialty” per se. Again, this is a problem that seems to affect professionals such as attorneys, doctors, or accountants. For whatever reason, our clients don’t seem to leave feedback on Yelp nearly as often as, say, a restaurant patron. For this reason, you will often see only a handful of reviews for an attorney compared to dozens of reviews for a local restaurant such as Grandview Tavern & Grille. Apparently because of this, Yelp tends to assume the relatively few reviews received by professional businesses are “fake” reviews rather than real ones. Look through many local professional listings and you will see reviews hidden as “not recommended” or negative reviews boosted above positive ones. At Lawrence & Associates, we have been fortunate enough to avoid any negative reviews on Yelp, although we’ve seen several clients express frustration that their reviews are not recommended and therefore not visible. Unfortunately, Yelp’s confusing assumptions about reviews for professional organizations tends to lead to the conclusion that there are not many reviews of the business out there or, worse, that the business’s clients are more dissatisfied with the business’s performance than they really are. In either event, this is again a problem that does not exist when using Avvo or Martindale Hubbel. Finally, it can be difficult to find the type of attorney you need by using Yelp. Yelp does not have categories for many areas of law that people in the Greater Cincinnati area commonly need. For example, Lawrence & Associates practices in bankruptcy, personal injury, social security, and workers’ compensation. Yelp has categories for bankruptcy and personal injury, but not for social security or workers’ compensation. Looking for a patent attorney? You can’t use Yelp. Until Yelp focuses more on professional services, it is probably a good idea to look elsewhere for referrals to local businesses. As stated above, Avvo specializes in attorney referrals (you can see the listing for Justin Lawrence here). If you need a referral to an attorney, call Lawrence & Associates. 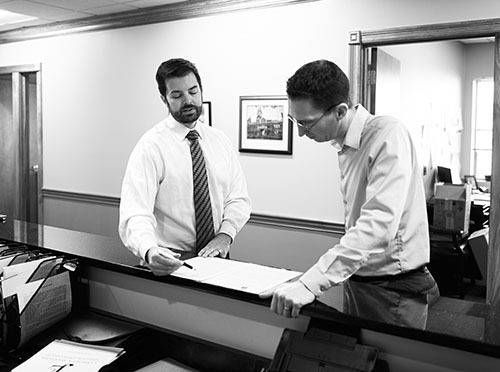 Even if we can’t help you, we are happy to refer you to another reputable attorney near you. Lawrence & Associates is Working Hard for the Working Class. Call us today!